You would probably already know that big data analytics is a trend that has been gaining momentum in a variety of fields. And it is actively used in digital technology development. Huge data volumes are processed every day by machines to help us get a result that we need. Today, big data can be used in completely different sectors. Including the real estate sector. But if you’re asking questions like – what is the potential of big data in the real estate sector? 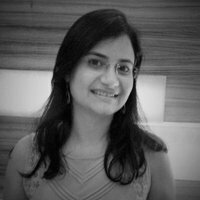 Why is data analytics needed and what are its advantages? This article will spell everything out. One of the ways data analytics can drastically change the real estate field is the way specialists build a business model, manage human resources better and optimize expenditures. 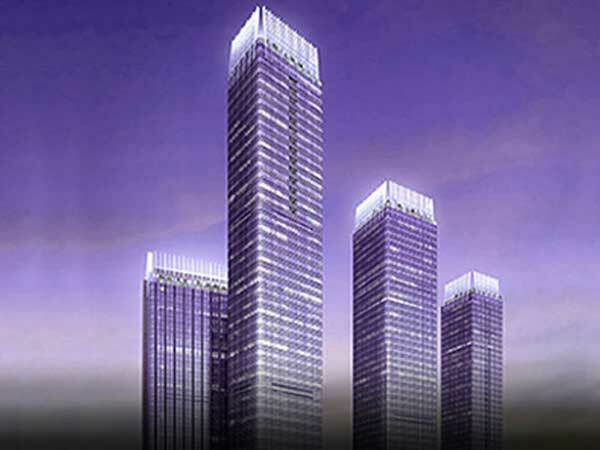 The commercial real estate market would go to a completely new level. With a new and different set of services provided. In fact, quite a few countries have already started to apply big data and analytics technology to manage, evaluate and monitor the real estate field. The new process automates the analysis of volumes of data. Which are received from multiple sources? There are many ways of how big data can be used in the real estate sector. Also, machine learning capabilities come into force as well – a huge amount of data now can be analyzed and processed much faster. In fact, big data in the real estate field makes the workflow faster and more efficient. By the way, new technologies also allow real estate agents to find a good location for building a new house from scratch. It will be a better option if we single out each advantage separately to define a total benefit of big data usage in the real estate. Real estate market is tightly connected with risks, and it is very important for specialists not to let their customers down. Reduction of financial risks ranks one of the first positions in this list. Predictive analytics comes to the rescue. Real estate companies can use predictive analytics to analyze the condition of the building considering all nuances, its age, information about the owner and so on. Given all the capabilities, specialists can provide a buyer with detailed information about a house without any dark spots. Predictive analytics helps real estate agents understand customers better and provide them with services they really need. Special algorithms can collect the data and requirements of each customer to provide all of them with a personal offer. Thus, customers’ engagement becomes stronger and trust towards real estate companies increases. Unfortunately, when people buy a house, they can receive not complete information about a house, and then it leads to misunderstanding and deal non-starter. Analytical tools that use big data help agents make accurate appraisals and show customers a real price for that or another building. 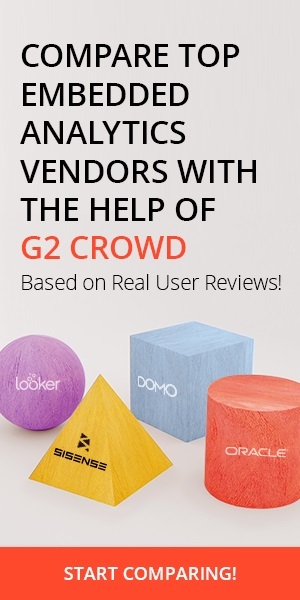 Also, big data allows agents to collect other useful information about a district, neighborhood, so customers will have all the information they want to know. As a result, if the price is real and it is estimated considering all the factors above, both parties get their profit. Bingo! Machine learning algorithms also improve the processing of data and accelerate it in a few times. Business processes become more transparent, light-fingered real estate agents will have to quit the game. AI-enabled algorithms select actual information for the indicated period of time, and artificial intelligence makes an optimal decision based on all possible options. AI algorithms should be integrated during real estate application development. So unfair game is impossible, fair business comes first, and it is implemented due to new technologies. The marketing side of a real estate business also becomes improved. Real estate agents often monitor social networks to collect more information about a customer and big data algorithms help them extract all information faster and more precisely. When agents get all the information they need, they can contact a person at the right moment and make a profitable and tempting offer. In addition, real estate agents always have all actual prices that are real for a current period time period, and big data plays not the last role in this process. Some people use insurance service to ensure their houses and it is a widespread process. So, no wonder that insurance companies also apply big data to analyze what insurance plans are better options for different regions. For example, big data analytics help insurance agents offer dwellers in various regions the right kind of insurance type, depending on specific particularities of that or another place. And both parties benefit again. 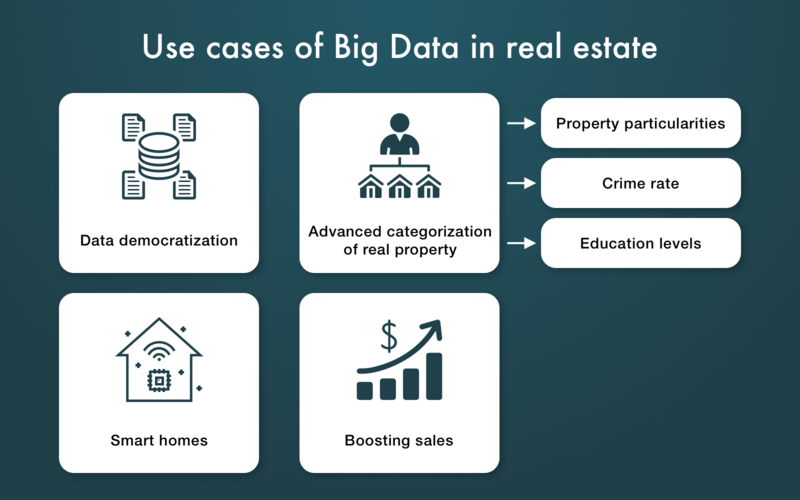 Many real estate companies already use big data for their business, and we will consider the main use cases and a couple of real examples. It means that all real estate companies want to provide their customers with transparent data and work on data democratization. Companies like Trulia, Zillow, Redfin, and many others fill their website with all topical information like recent surveys, lists of homes for sales or rent, and other info that can be important for sellers or buyers. All information should be real-time and authentic, so big data processing is performed by many companies to let customers perform real estate operations efficiently. We can single out Zillow company as the one that applies big data processing. Zestimate tool makes it possible for customers to estimate the real value of that or another apartment or house in a specific region. In addition, the Zestimate tool will be able to predict a possible potential price of selected property in future due to artificial intelligence algorithms. These are the filters that allow buyers to find a property in the region they need and find out everything about that region. You may imagine that it requires processing of huge amount of data, so big data processing comes to the rescue. Big data processing is also used to detect the crime rate in the region, so users may learn in advance how criminal the district is. Do you probably know what the Internet of Things is? 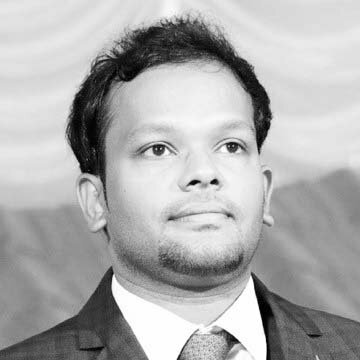 When one device is connected with others and they together can implement many useful operations. Home with IoT is called a smart home. So many sensors around house collect different information and then big data is used to process this data quickly and efficiently. So big data in real estate plays a very important role and it simply cannot be ignored. 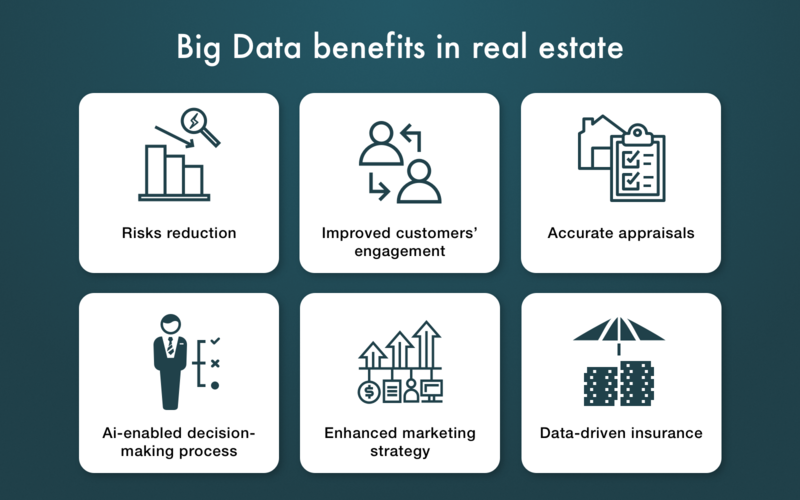 Real estate companies use big data also to understand their customers better, and in turn, it helps them gain more profit and achieve new heights. Trulia provides its customers with Trulia Insight service that helps analyze customers’ preferences, financial status, purchase history and so on. Thus, real estate companies can offer their buyers and sellers the best conditions and tempting offers, and it leads to higher trust and customers’ loyalty to the company. As you can see, the potential of big data is limitless. And in the (hopefully foreseeable) future, the number of use cases of big data in real estate will be increased for sure. 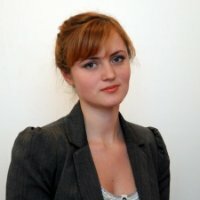 Nataliia Kharchenko is a Technical Writer at Cleveroad. It is mobile app development company in Ukraine that successfully implements various projects of any complexity. The main goal of the company is to provide clients with quality and exceptional software. 89% of finance teams yet to embrace Artificial Intelligence: Here is why!